This RADIOLA! is not so much about multi-tasking as it is about juggling. RADIOLA! streams continuously from my Live365 station. Rusty sabre dance-cast here. Each RADIOLA! is sent to subscribers on my mailing list (email here). They said it couldn't be done! And they were right. No RADIOLA! this week. This should tide you over. This RADIOLA! just can't seem to keep the quick brown fox from the door. RADIOLA! streams continuously from my Live365 station. QWERTY-cast here. Each RADIOLA! program is sent to subscribers on my mailing list (email here). This RADIOLA! has nothing further to say about desserts. RADIOLA! streams continuously through my Live365 station. Role twaddle-cast here. Each RADIOLA! program is sent to subscribers on my mailing list (email here). To enlarge, click on the picture. It should be more easily readable if you download the image (using right click and "save image as. . .") and enlarge it through whatever photo program you prefer. This RADIOLA! celebrates a diminishing abundance, among other things. RADIOLA! streams continuously from my Live365 station. Lighter than on the air-cast here. Each RADIOLA! program is sent to subscribers on my email list (email here). 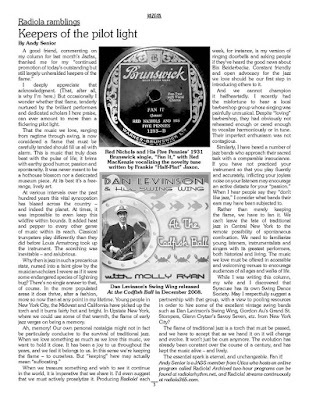 Here's something I'm really celebrating: the first part of my two-part profile appears in The American Rag this month (adapted by Russ Tarby from his piece in the April JAZFAX), and articles under my byline will be published there beginning in a month or so. I've submitted the first one, which has been accepted for publication. Please consider subscribing to The American Rag, which is an invaluable print resource for those who encourage keeping ragtime and traditional jazz alive in performance.